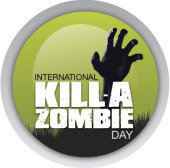 Though announced by Sophos on Halloween Eve (Oct. 30) two years ago, International Kill-A-Zombie Day is just as relevant this Halloween as it was then. So, with Halloween 2011nigh, let’s redouble our efforts against malicious software. It’s still out there, you know. Have you noticed any drop in activity? “Millions of computers around the world, in homes and business premises, are – without the knowledge of their owners – under the control of cybercriminals who commandeer the PCs to send spam, distribute malware, and commit identity theft,” says Graham Cluley, senior technology consultant at Sophos.